You can get into the Waste Management Open FORE less! SCOTTSDALE, AZ — Next week, Arizona will host one of its signature events, and one of the most-attended golf tournaments in the country: the Waste Management Phoenix Open. If you're planning on going, make sure to read our online guide . It has everything you need to know about getting there, where to park, and the best spots to eat and drink along the tournament grounds . The tournament runs Jan. 28 - Feb. 3, 2019. General admission is $45 on Wednesday, Thursday and Sunday, and $60 on Friday and Saturday. There are a handful of freebies, discounts and promotions you should know about. Ford Free Days: The first two days of the Phoenix Open -- Monday, Jan. 28 and Tuesday, Jan. 29 -- are FREE. There is no admission fee. Monday and Tuesday both serve at practice rounds for the PGA golfers. Monday is also the Kadima.Ventures Pro-Am. Tuesday is the R.S. Hoyt Jr. Family Foundation Dream Day and San Tan Ford Special Olympics Open. Free admission for kids: Children and teenagers, 17 and younger, can get into the Phoenix Open for free all week as long as they're accompanied by a paying adult. Free admission for military and first responders: Military members -- active duty, reserved, retirees and veterans -- and police officers, firefighters and emergency medial technicians (EMTs) can get free* admission for himself or herself, and a guest each day of the tournament. You have to register through " Birdies of the Brave " to claim the tickets. *There is a $1 verification fee per person who applies. 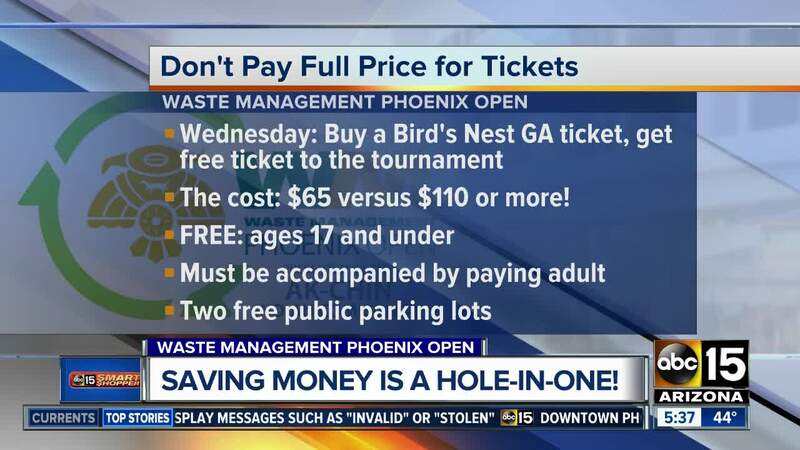 Safeway/Albertsons promotion: Customers who spend a minimum of $50 on a specific list of items at Safeway or Albertsons can receive a free general-admission ticket to the Waste Management Phoenix Open. View list of items. View list of items . Free parking: There are two free public parking lots for the Phoenix Open and each has a shuttle that will drop people off at the entrance gates to the tournament. Lot H is near the Loop 101 and Hayden Road and will be open for the length of the tournament. Lot W is located at WestWorld of Scottsdale near 94th Street and Bell Road. Lot W is open Wednesday - Sunday, and closed on Monday and Tuesday. Lot H: Monday-Tuesday from 7 a.m. - 6 p.m.; Wednesday - Saturday, 7 a.m. - 11 p.m., and Sunday, 7 a.m. - 6:30 p.m. Lot W: Wednesday-Saturday, 7 a.m. - 11 p.m.; and Sunday, 7 a.m. - 6:30 p.m.
Free shuttle from Scottsdale Quarter: The Scottsdale Quarter is offering free parking and a free shuttle ride to the Phoenix Open on Friday, Saturday and Sunday, Feb. 1-3. The 14-seat bus will pick-up and drop-off people at Kona Grill form 12 p.m. - 5 p.m each day. There is one bus making back-and-forth trips so timing will depend on traffic and drive times. Kona Grill is located at 15345 N Scottsdale Rd #K-100 Scottsdale, AZ 85254.